Social media sites already offer free advertising in the form of tweets and Facebook posts, but these tools can only take your brand so far. The next step involves paying for social media ads, and if you're considering this option, you're probably most concerned with one big question: What will my return actually be? Will spending money on an ad on Twitter or Facebook bring more customers to my business than the same amount spent on Google AdWords? I put that question to the test by setting up experimental ads across five services: Google AdWords, Facebook, Twitter, LinkedIn, and StumbleUpon. I wanted to see exactly how these tools benefited my own content-creation and corporate blogging business. 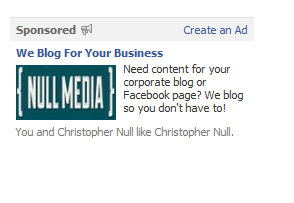 Indeed, Null Media is exactly the kind of small business that could benefit from social media ads—in theory. First, a few words about the baseline for this experiment—Google AdWords—where I had already been running ads for several months. For this test run, I raised my overall budget to $25 a day to make it comparable with the social media sites being evaluated. (See page 2 for how I tested.) I quickly discovered that my budget wasn't being exhausted because my bids were too low. By raising these bids to about $2 per click, in line with other services reviewed here, I received more traffic, but not much. Over the course of the ad run, at both low and high bids, I received 13,970 impressions and got 65 clicks for a total of $80.74. That's an 0.47 percent clickthrough rate at an average price of $1.24 per click. The verdict: What may sound like poor performance is actually quite good, and since those ads are delivered to people who are actively searching for terms I'm targeting with my keyword ads, that represents a worthwhile investment. Over 1 billion served, but what about your customers? Setting up my ad with Facebook was by far my most complicated experience with these services, although its management system and tracking services are quite powerful. The hassles began right from the beginning. I waited all day for my first ad to be approved, but it was "pending" indefinitely. I canceled it and tried again the next day, and it was abruptly approved within minutes. 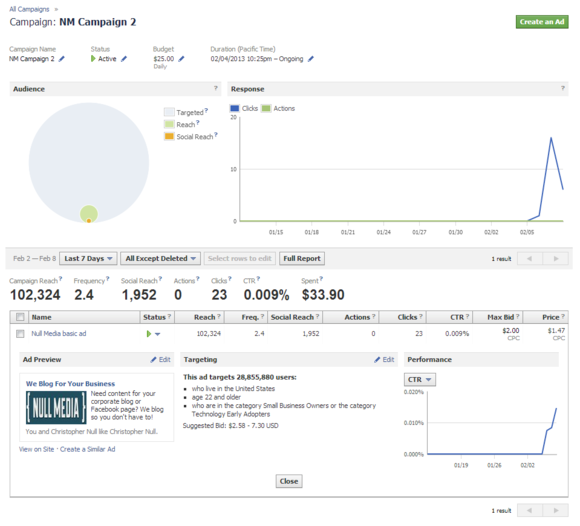 Facebook offers both CPC (cost per click) and CPM (cost per thousand impressions) ads. I settled on a CPC ad, targeting Facebook users who expressed an interest in various business topics, with a bid of $0.15 per click. Twelve hours later, the ad had received no impressions, likely because the bid was far too low. Facebook suggested a higher bid of $0.57, which got things moving, but slowly. A day later, Facebook's reporting tool suggested an even higher bid of $1.41. Again, impressions increased, but not clicks. Another day later, I raised the bid yet again to $2, at which point Facebook suggested a bid between $2.58 and a whopping $7.30 per click. The final ad results from Facebook. What was going on here? I'm still baffled. Is Facebook's ad bidding a bait-and-switch system or just bad programming? Regardless of how much you pay, Facebook encourages you to pay even more. Yes, higher bids result in additional clicks because your ad is displayed more often, but shouldn't Facebook's system be smarter about its recommendations? After four days, the numbers were in, at a mammoth 253,207 impressions and a mere 25 clicks. The total clickthrough rate was an infinitesimal 0.01 percent, at a total expense of $37.70. That works out to an average CPC of $1.51. LinkedIn makes a special pitch for SMBs. I'm advertising a B2B service, so LinkedIn sounded like a perfect match. Like Facebook, LinkedIn offers both CPM and CPC ads, so I gave a CPM ad a whirl for my first day, bidding the minimum allowed rate of $2 per 1000 impressions, targeting a fairly broad segment of LinkedIn users with job descriptions relevant to my product. My ad began showing within about 10 minutes, and took off. I hit my $25 limit within an hour. The results for this first day were 13,643 impressions and 6 clicks, for a 0.044 percent clickthrough rate and a whopping $4.17 CPC. The CPM ad did not feel cost-effective, so I switched to a $2 CPC bid and turned on the "Collect Leads" option, which encourages people who click on your ad to provide contact information. The final tally: After four days, my ad had 51,192 impressions, 13 clicks, and a low 0.025 percent clickthrough rate. My total spend was $41.50 for a $3.19 average CPC. Take out the first CPM-ad day, and the clickthrough suffers—a net 0.019 percent rate—but the CPC of $2.36 (more than my bid, oddly) is more affordable. I never received any leads from LinkedIn, however. 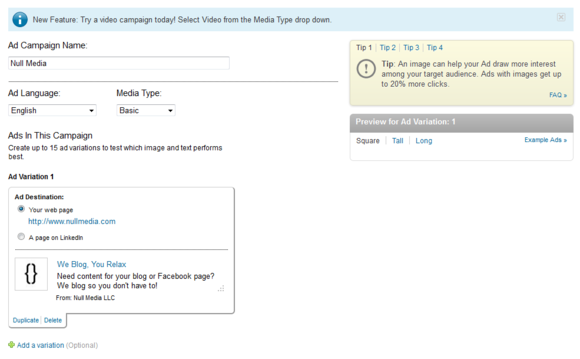 The verdict: After my ad ended, LinkedIn emailed suggestions on improving my ad's performance. It said the site's "better performing ads" averaged a 0.02 percent CPC, so my ad actually seems to have been a pretty solid performer for LinkedIn, compared to those by other advertisers. 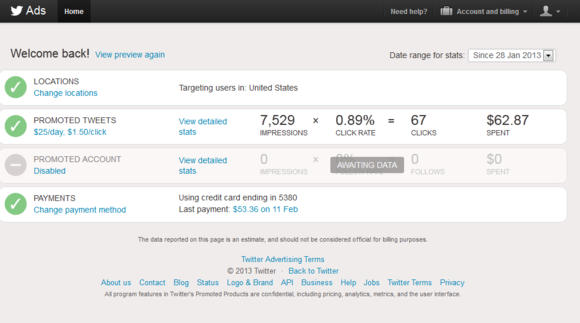 Twitter has just beefed up its ad analytics. Setting up ads on Twitter is fast and painless. I submitted a single promotional tweet linking back to my home page, with a $25 per day budget and a per-click cost between a penny and $1.50. My ad attracted two new followers. My ads began showing up within minutes. There doesn't appear to be any manual approval process. Reporting is simple and straightforward. The verdict: The total expense of $62.87 is pricey for such a small number of impressions, but the clickthrough rate is still impressive. StumbleUpon's ad results were surprising. At StumbleUpon you don't bid for impressions. Instead, you pay a flat rate to have your ad displayed to "stumblers" as they use the website. You don't write ad copy and you don't even have to rely on an ad being clicked upon. The page you're advertising just appears in the Stumble flow of users as they click along. Ad impressions cost a flat 10 cents each, an amazing bargain. StumbleUpon ads: A sleeper hit? 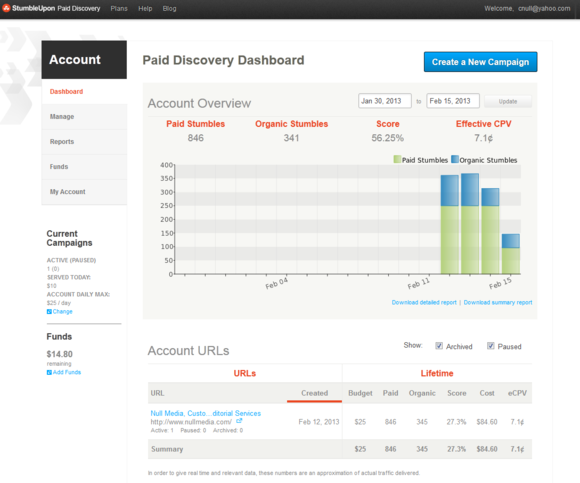 Because no bidding system or variability is involved, StumbleUpon's tracking is very straightforward. Over four days, my ad was displayed 1001 times (or 250 times a day at 10 cents each), and my website received a surprisingly high 397 organic stumbles on top of that. While I paid $0.10 per paid ad view, the "effective" cost per view including the organic stumbles was just $0.072 per view. The verdict: These are very cheap ads, but the effectiveness of advertising a B2B service on a heavily consumer-focused service is also questionable. Click the Reports link under your Account profile to generate a more detailed look at who looked at your ad and for how long. Facebook ads appear particularly ineffective at getting clicks, possibly because users have already become accustomed to ignoring these ad placements due to their location. Experiment with low CPC bids on Facebook when getting your feet wet. LinkedIn is easily the most expensive service on which to advertise, and clickthrough rates are low. Twitter's almost 1 percent clickthrough rate is double the rate of AdWords, and far and away the best I encountered. Ads are surprisingly cheap. It's difficult to target your ads on Twitter, but they still appear effective despite this limitation. Perhaps that's because promoted tweets are virtually impossible for users to ignore. StumbleUpon is a great option for extremely inexpensive ads, and if you are targeting a broad swath of consumers, it's definitely worth a look. If you're sold on social media advertising, consider these tips before you begin. Start small. Set a very low budget for a CPC (not CPM) ad, and let it run for as long as you can to get a sense of how it's performing. Tweak the ad frequently and track your results. Some services let you run multiple versions of the same ad, so you can compare results among them. Clicks aren't everything. Despite getting hundreds of clicks over hundreds of thousands of impressions, my business didn't net any new clients from these ads. Understand what value your clicks actually bring to you, and make sure your ROI is positive after you have sufficient history to examine. Think about your target market. It's an old adage that "Twitter is for business" and "Facebook is for fun." My experimental results bore this out, so think carefully about what social networks your potential customers are likely to be using before charging ahead. How effective is a social media billboard? 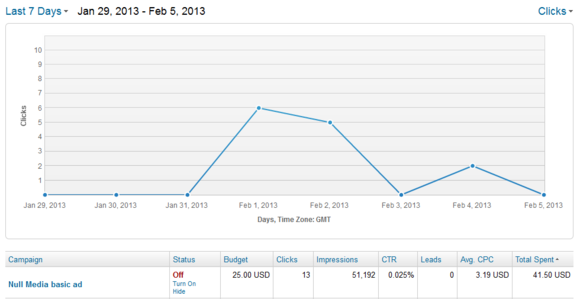 I ran a baseline of four days of Google AdWords advertising, with the same budget, before running the social ads. I then shut off AdWords. I designed all advertising to send traffic to the home page of my business, Null Media, and not to various social network profile pages, in order to better compare those results with AdWords' results. I tested each social network consecutively, and ads were programmed so they did not overlap. If an ad network did not use up its ad budget for a day (due to the vagaries of the way ads are presented and bid upon), I did not extend the length of the experiment. Shortcomings in budget expenditures are noted. I tracked results using the services provided by each social media site. When at all possible, I used both the same criteria for the desired viewers of an ad (such as location, demographics, and occupation) and the same ad copy and imagery. I kept all social media accounts active by posting fresh content, two to three times daily, across each account. Some content linked back to the Null Media target domain; some did not. I like your blog post. I have really come to know some good ways to make money from your blog. Please update your blog regularly. Thanks for your nice post. If you're looking for the #1 Bitcoin ad network, try out MellowAds. Did you know you can create short urls with Shortest and receive money for every click on your short links.